Have you checked Facebook’s “Posts By Everyone” search feature, chances are you might have overlooked it because search results aren’t shown by default. “For e.g. 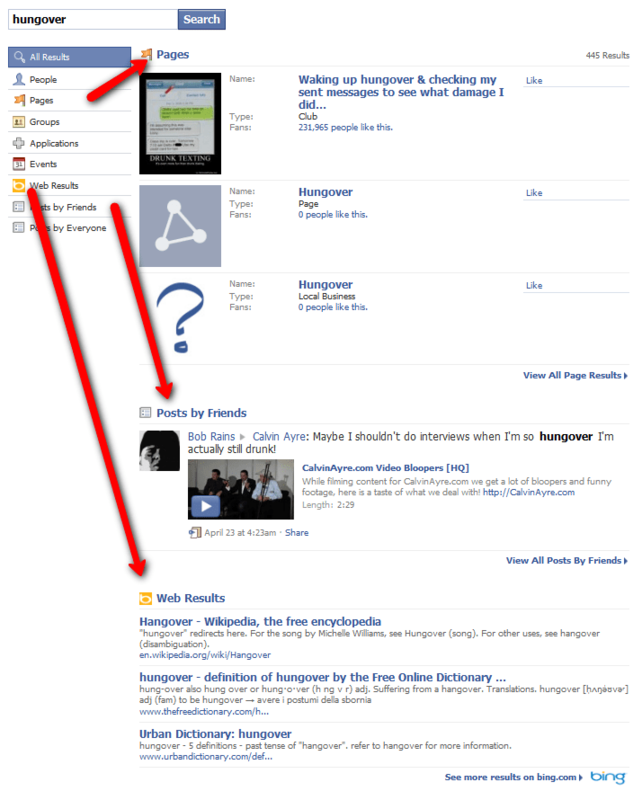 search for [hungover] –when you start typing, Facebook suggests some options right within search box. Pick any of those, and you go directly to a person, page or app, rather than overall search results. It’s easy to do this by hitting enter, so that you never get the search results at all. If you go to bottom, there’s a “More Results” option as highlighted above. Click that, and a broader set of results appears. On the left-hand side of the results, there’re options to get results back from following categories: All Results, People, Pages, Groups, Applications, Events, Web Results, Posts By Friends, Posts By Everyone,” noted Danny.